Guide Michael Silitch was featured in an article in Outside Magazine that describes his attempt to become the first American member of the world’s oldest mountain-guiding service, the Campagnie des Guides de Chamonix, France. The company was formed in 1821 and has built an almost exclusive team of guides. 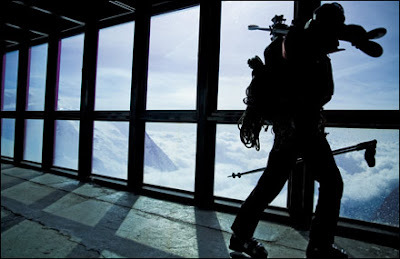 Over its 188-year history its membership has been nearly exclusively limited to Chamonix-born guides, with a few exceptions for guides of great renown. There are four stages of becoming a Chamonix guide and Michael has made it through two. He is considered a renfort prioritaire, a "priority reinforcement," which entitles him to some company work, a first for an American. Silitch feels by showing he is there to stay and very committed, he will eventually be voted in. Michael spent his beginning years guiding for AAI in the North Cascades, Canada, and Alaska and in 1994, he began guiding for the Institute in France. He eventually settled there with his wife and is now living there year round and raising a family. He has truly embraced the French culture, and he, his wife, and their two sons speak fluent French. We wish Michael well in his pursuit and hope he becomes the first American guide to be admitted to the Campagnie des Guides de Chamonix.